The BBC Ten O'Clock News (also known as the BBC News at Ten or more commonly, the Ten O'Clock News) is the flagship evening news programme for British television channel BBC One and the BBC News channel. It is presented by Huw Edwards, and deputised by Fiona Bruce. It is the final comprehensive news programme of the day on BBC One. The programme was controversially moved from 9:00pm on 16 October 2000. The main presenter also holds the lead presenter for major breaking news for BBC News. It is broadcast Monday to Sunday at 10:00pm. It features twenty-five minutes of British national and international news, with an emphasis on the latter. On weekdays, it incorporates around seven minutes of news from the BBC regions around the country at approx 10:25pm to 10:35pm weekdays or 10:15 to 10:25 weekends, which is then followed by a national weather forecast. During the first three months of its revival, ITV News at Ten averaged 2.2 million viewers compared with an average of 4.8 million viewers watching the BBC bulletin over the same period. The BBC News at Ten is currently the most watched news programme in Britain, averaging 4.9 million viewers each night. The programme was launched on 16 October 2000, replacing the former BBC Nine O'Clock News, which had been on the air since 14 September 1970. Its launch presenters were Michael Buerk and Peter Sissons. The move to 10 o'clock was a response to the controversial decision by the BBC's main rival, ITV, to axe ITN's more popular and long running, News at Ten programme which aired on weeknights on the channel. Following the controversy, ITV reinstated a 20-minute news bulletin at 10 o'clock due to its unpopular decision. This subsequent move garnered much publicity at the time as it provided a head to head clash of BBC News with ITN. BBC News at Ten O'Clock eventually became the more popular programme and in turn established itself on the BBC One schedule and importantly with audiences. ITV's offering declined in the ratings which itself wasn't helped by poor scheduling and ITV ended the head to head clash in February 2004 by moving its news programme to 10.30. 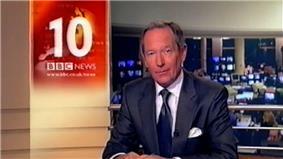 In 2008, ITV reinstated ITV News at Ten which remains the programmes main competitor. Buerk and Sissons left the BBC Ten O'Clock News on 19 January 2003 to make way for presenters Huw Edwards and Fiona Bruce. To mark this presenter reshuffle, on Monday 20 January 2003 as Edwards and Bruce took over, the bulletin and the rest of BBC One news bulletins were relaunched with a new studio. Since 5 February 2006, the bulletin has been simulcast on the BBC News channel as part of the BBC Ten O'Clock News Hour. This consists of the BBC One bulletin for the first half hour, with the second half coming from the News channel studio, which is usually presented by Clive Myrie Monday-Thursday and Martine Croxall Friday-Sunday. It includes a paper, sport and business review. On 21 April 2008 the programme, along with the rest of BBC News, underwent a graphical refresh and moved into a refurbished studio (N6). It also changed its name to the BBC News at Ten. After the regional news, there is a weather forecast from the BBC Weather Centre: presenters include Rob McElwee, Peter Gibbs, John Hammond and Philip Avery. BBC News at Ten has been named 'News Programme of the Year' by the Royal Television Society on numerous occasions, in 2005, 2009 and 2010. 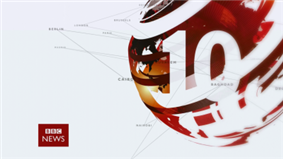 The programme, along with the BBC News channel and the other BBC One bulletins, moved to Broadcasting House and began broadcasting in high-definition on 18 March 2013. As well as presenting from the main studio, the main presenters are called upon to present on location when major stories break. For example, Huw Edwards reported live from Washington for the 2008 and 2012 US Presidential Elections and has presented live from Basra at the withdrawal ceremony. He also regularly presented from Westminster, as well as from Edinburgh (at times when the referendum for Scottish independence was being developed). ^ "News viewers turned to BBC in 2007". BBC Press Office. 7 December 2007. ^ "BBC News' television output moves to new studios at Broadcasting House". BBC. 2013-03-18. Retrieved 2013-03-18. If there is no position before the years of being a presenter, then this newsreader was either a relief presenter or occasional guest stand-in presenter.